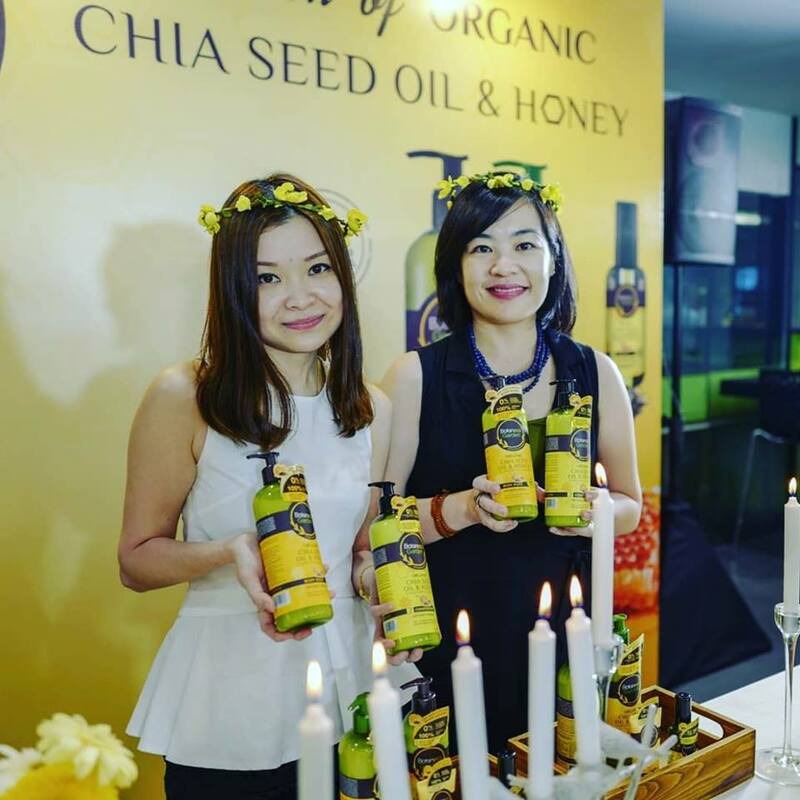 From Left) Ms Michelle Yeap, Brand Manager of Guardian Health & Beauty Own Brand Malaysia & Brunei, and Ms Wong Vai Chi, Head of Marketing, Guardian Health & Beauty with the newly launched Botaneco Garden Chia Seed Oil & Honey Hair and Skin Care range. Guardian Malaysia has introduced the Botaneco Garden Organic Chia Seed Oil and Honey range, a nature inspired solution that deeply moisturises and protects dry skin and hair with the benefits of traditional home remedies minus the mess. Busy parenting didn't stop me from taking care of myself. Talking of hair care not forgetting our hands too. 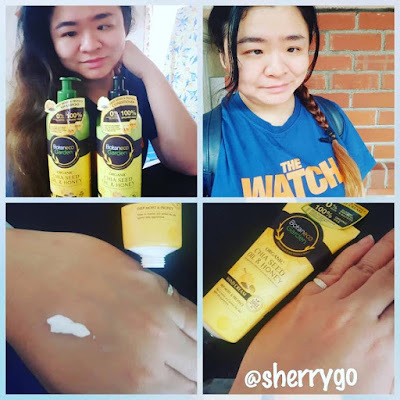 Parents would know that there's alot chores to do at home, I like this Botaneco Garden Organic Chia Seed Oil and Honey Deep Moist and Protect Hand Cream it's non sticky. Botaneco Garden Organic Chia Seed Oil and Honey Deep Moist and Protect Hand Cream 60ml helps to nourish and protect the skin against daily aggressions. Its lightweight, non-greasy and a non-sticky formula. I am using the Botaneco Garden Organic Chia Seed Oil and Honey Deep Moist and Protect Shampoo, suitable for my hair as I have long hair and bleached it's often dry and damaged due to colored. Botaneco Garden Organic Chia Seed Oil and Honey Deep Moist and Protect Shampoo 500ml is ideal for dry and damaged hair as it deeply moisturises for nourished, soft and smooth hair. Improves hair elasticity and manageability while helping to restore natural hair shine and gloss. Enriched with Panthenol and Hydrolyzed Protein, it helps to increase hair strength, to reduce the formation of split ends and cuticle damage by smoothening the hair cuticle. Helps to protect hair damage from heat, UV and sea water. For me it's important not just used the Shampoo but also Hair Conditioner. Botaneco Garden Organic Chia Seed Oil and Honey Deep Moist and Protect Conditioner 500ml is ideal for dry and damaged hair as it deeply moisturises for nourished, soft and smooth hair, while improving hair elasticity and manageability. Themed ‘Be A Mess Free Beauty’ the launch held at A Cut Above Academy, highlighted the messy challenges of preparing DIY beauty remedies using chia seed and honey in a light-hearted take on YouTube tutorials, while sharing the benefits of the two ingredients for the real problem of dry skin and dry hair. Air-conditioned environments, blow drying hair on high heat and harsh personal care products that do not suit the skin and hair condition of the user can all contribute to dryness. As we get older, skin loses the dewiness of youth, and our scalp produces less oils resulting in dry hair. With so many factors arrayed against achieving the holy grail of dewy, smooth skin, and lustrous, shiny locks, what can you do? The new Botaneco Garden Organic Chia Seed Oil and Honey range offers a solution for eco-conscious consumers who prefer a gentle yet effective personal care range. It includes the aptly named Deep Moist and Protect shampoo, conditioner, hair oil, body wash, body lotion and hand cream for daily hair and skin care focused on moisturisation and protection of dry to normal skin and hair. The range is formulated with 100% eco-certified organic chia seed oil from Germany to restore skin and hair’s natural moisture barrier and to retain moisture, and enriched with organic honey extract from France that is high in minerals, vitamins and anti-oxidants. The combination of 100% eco-certified organic chia seed oil and organic honey extract provides moisturisation and hydration that is ideal for dry to normal skin types. 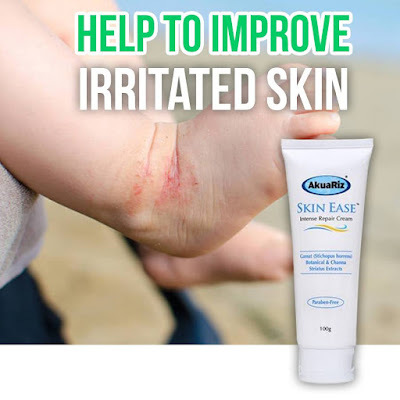 It is dermatologically tested and proven. It is not tested on animals. The entire Botaneco Garden range of 58 products, including the new Organic Chia Seed Oil and Honey line is available only at Guardian Malaysia. 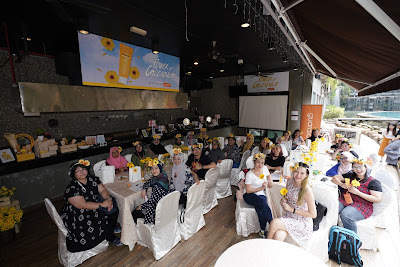 Guardian Malaysia now operates a chain of over 400 stores, providing an unrivalled variety of Pharmaceutical, Health and Beauty products to more than 2.5 million Malaysian customers a month, across the country. 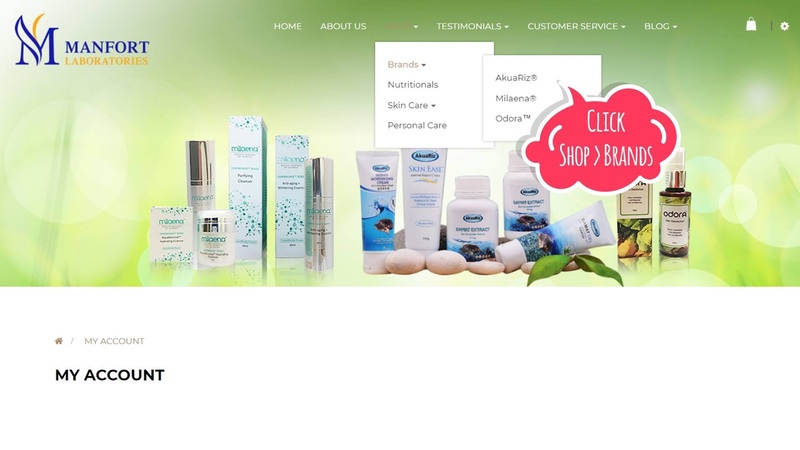 It is among the leading health, beauty and personal care chains in Malaysia. Guardian Health & Beauty Sdn. Bhd, Brand Manager, Health & Beauty Own Brand, Malaysia & Brunei, Ms Michelle Yeap explained that the Organic Chia Seed Oil and Honey range was developed to deliver mess-free products based on global cosmeceutical trends, and the needs of Guardian’s customers in the region. “Nature-inspired, deeply moisturising and protective solutions for dry skin and dry hair are high on our customers’ wish list. 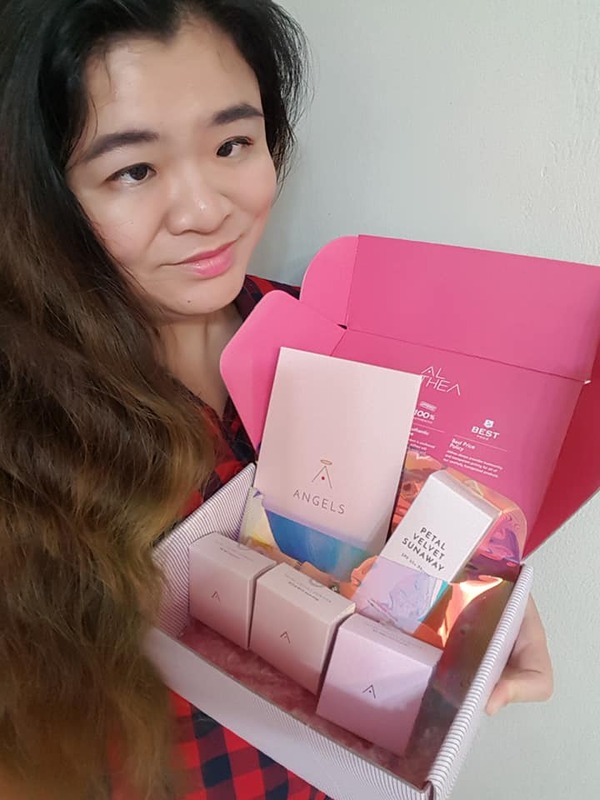 We studied numerous eco-certified and organic ingredients before finding the unique combination of 100% eco-certified chia seed oil and organic honey extract that provided the effective moisturising and hydration and benefits for dry to normal skin,” Ms Yeap said. The Botaneco Garden team demonstrated the possible DIY fails and messiness of preparing chia seed and honey beauty aids for skin and hair in the Botaneco Garden Mess Free Beauty YouTube studio. There are five product lines under the Botaneco Garden brand namely Inca Inchi which uses Inca Inchi and Aloe Vera as key ingredients, the premium Organic Argan and Olive Oil range, Botaneco Garden Baby which uses eco-certified chamomile and colloidal oatmeal for a gentle and effective baby range; the Trio Oil range which uses 100% eco-certified oil - Babassu oil, Baobab oil and Chufa oil, and the new Organic Chia Seed Oil and Honey range. The Botaneco Garden Organic Chia Seed Oil and Honey range is priced from RM 9.34 for the Deep Moist and Protect hand cream to RM18.77 for the Deep Moist and Protect shampoo, conditioner, body wash and body lotion. The entire line is available at all Guardian stores nationwide, and through the Guardian e-store www.guardian.com.my. For more information on Botaneco Garden please visit http://www.botanecogarden.com/en-my/ or follow mybotanecogarden on Instagram. 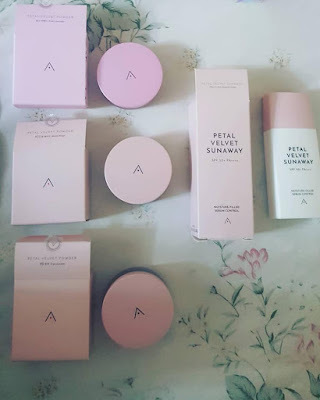 With busy parenting, I like to share with you products that I like it's the Althea Petal Velvet Sunaway sunscreen kit. This is from South Korea, it is lightweight texture with powerful uv protection. No kidding you are purchase your ordered from Althea and it reaches you within two weeks! 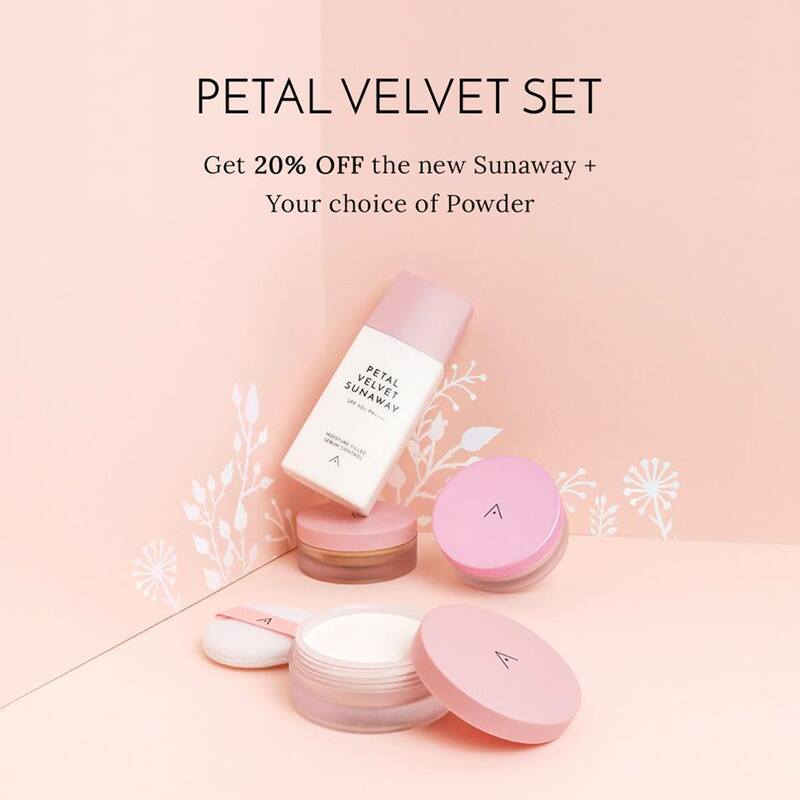 You can shop this online at Althea Korea, 20% OFF Petal Velvet Set, Sunaway + your choice of powder. As photo below you see has got three choice of powders. So cute the Althea hologram pouch as I can fit in three Petal Velvet Powders inside. Gentle on skin on skin without chemical ingredients. If you like to know list of ingredients, click on the link. Control the excessive sebum on the skin with a micro powder system, while hyaluronic acid ensures skin is kept hydrated throughout the day. Petal Velvet Sunwaway contains Damask rose extracts to moisture and smoothen the skin. Damask rose has a natural nanomolecular composition that is rich in vitamins to penetrate deep into the skin, soothing sensitiveness and strengthening it for a radiant glow. Micro particles absorb sebum and excess oil from the skin to give a light, velvety finish. As you apply the Sunaway, it moisture and deeply hydrates the skin. How to use it? Shake well before usage. Apply a generous layer evenly onto face in the morning or before sun exposure. Daily use for those looking for a long wearing, strong protection sunscreen for a everyday use. Moisture sebum control for people who want a moisturizing sunscreen, but without a white cast or thickness. Suitable for all skin types and even those with sensitive skin. Korea's award-winning skincare and beauty brand Aprilskin is now available in Malaysia, yeah it is exclusively at selected Guardians stores. Coveted for its overall effectiveness in giving natural, dewy and radiant complexions, the accessibility of the brand in Malaysia shores ends the hassle of searching for these sought-after products online for k-beauty and skincare ethusiast. 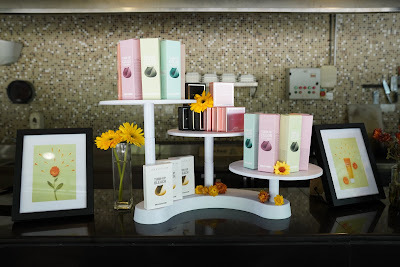 Founded in 2014, Aprilskin has gained popularity and build up loyal followings shortly after with the launch of Signature Soap Original, a deep cleansing natural soap, leading the 3rd Generation K-Beauty wave in and outside of Korea. The brand gained its international fame with its products formulated with nature's good ingredients to restore skin's natural radiant glow. Aprilskin's Perfect Magic Cover Fit Cushion (RM133.96). Powered by 67% ultra-hydrating water drop serum, the moisture-charge formula with glowing finish locks in makeup for 24 hours. If you haven't read about Guardian Malaysia's wellness retreat, click on the link to read about it. Real Calendula Peel Off Pack (RM66.98) is a refreshing peel off mask that is fortified with real calendula flower petals, extract and oil. The gently yet powerful formula helps lift away dull, dead skin dirt and debris to reveal visibly cleaner, smoother and radiant skin. 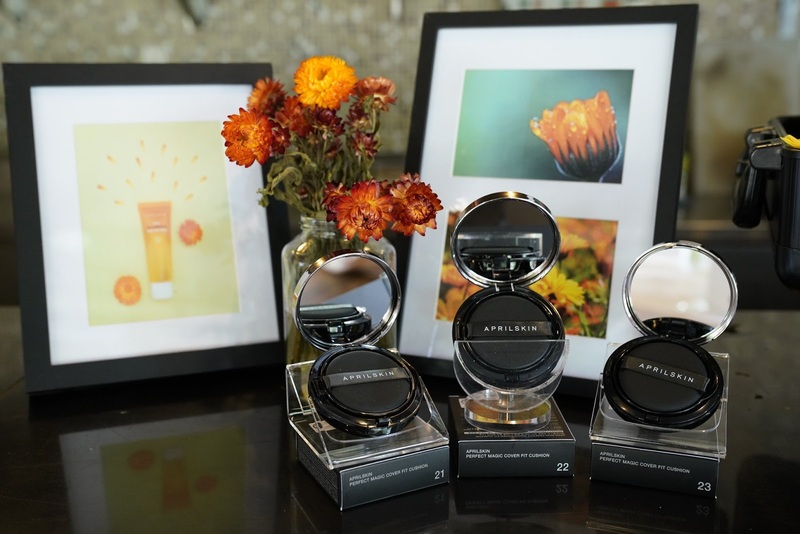 Playing a key role in the peel off pack is the Calendula nutrient which help to calm and hydrate skin to reveal a smoother and brighter complexion. Formulated from key ingredients such as the calendula extract which helps to condition and soothe skin complexions, calendula oil which protects and soothes skin complexions, and flower complex made of chamomile lavender, starflower nd cornflower extract works together with calendula to control excess sebum and soothe skin - the Real Calendula Peel Off Pack is the perfect peel off mask to help soothe and calm skin. To use: Shake well to evenly distribute the calendula petals. Thereafter apply a thin even layer to clean, dry skin, while avoiding eye area, eyebrows, hairline, and mouth. After application, leave on for 30 minutes, then gently peel off mask from outer edges. And rinse off any residue with warm water. Recommended to use product 1 - 2 times a week. 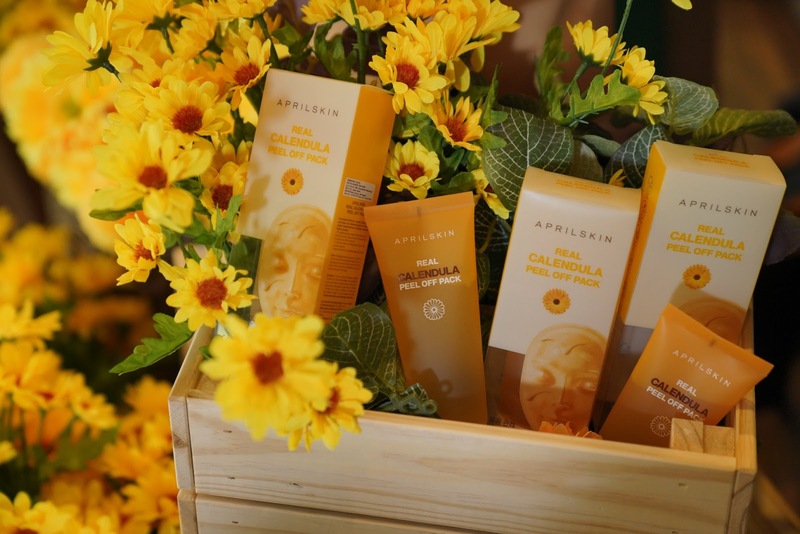 Aprilskin's Turn-Up Color Treatment (RM36.79) is a commitment-free, damage-free temporary hair tints that double as hair treatments to deliver silky-smooth hair texture. It comes in a total of 8 different colours from purple to green blue. The hair things promise to fade after 15 to 30 washes while providing nourishes hair with shine and without damaging the cuticles by attaching the colour pigment on the surface of the hair. Formulated with key ingredients such as Rosemary extract which helps to stimulates hair growth, Lavender extract which helps to prevent hair loss, Sage extract which increases the circulation in hair scalp, and Jojoba seed oil which hydrates hair. To use: Wash haiir with shampoo (without conditioner or any hair treatment) and lightly dry the hair. Put on gloves and gown then start applying appropriate amount of the hair tint on hair. Leave the hair tint on for 10 minutes for a natural shade or 20 minute for a vivid shade. Lastly wash off the hair tint with lukewarm water. Aprilskin is now available in Malaysia at selected Guardian stores such as Guardian Sunway Pyramid, Guardian One Utama, Guardian KLCC, Guardian Starling Mall, Guardian Midvalley and many more. Indeed a fun time with Aprilskin at Guardian Media Retreat, we have a great time as we have hands on diy making flower headband and also trying out the product of the Real Calendula Peel Off Pack and know other products of Aprilskin.To view more photos can visit my Facebook's album, click on the link to see. 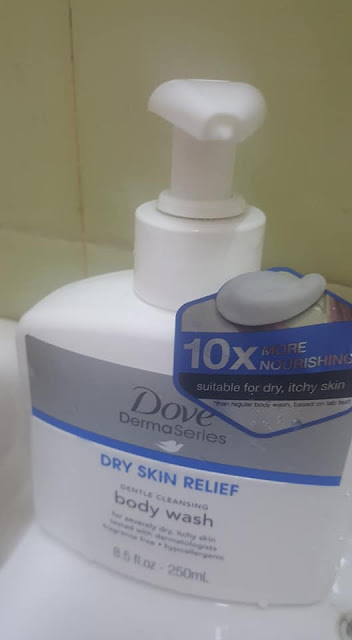 Due to humid weather, my skin is feeling dry and itchy especially at night.Glad to have find this body was of Dove DermaSeries, Dry Skin Relief gentle cleansing body wash. I am using this body wash and glad it's suitable for me. A unique blend of skin-natural lipids, sunflower oils, mild cleansing actives make this our daily cleansing care for extremely dry skin. Gentle removes impurities and providing lasting nourishing. Gently apply with lukewarm water. Rinse thoroughly. 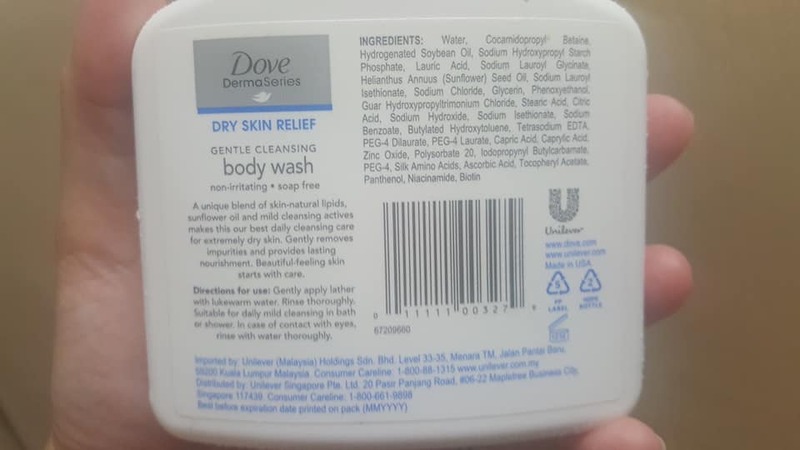 It is 10x times more nourishing and it's suitable for dry skin, itchy skin. 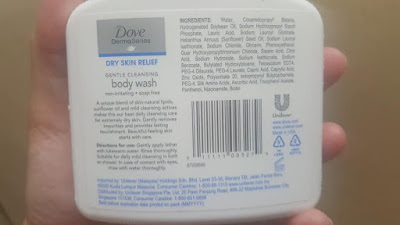 It is non-irritating, and soap free. Product is made in USA. 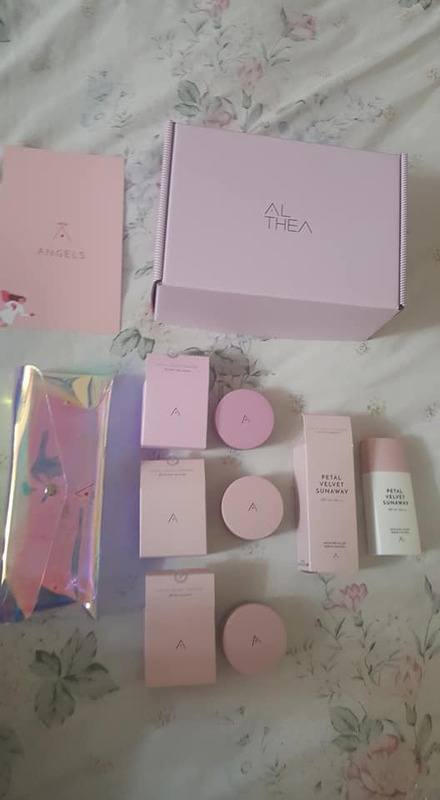 Where to shop this product? You can shop this at Guardian outlets in Guardian Malaysia. *depends on individual as everyone has different skin condition. How's everyone today? Good day to my dear readers and visitors of my blog. It's been a very long and tiring day as I am not feeling so well and my sons are having examination this week at school. Sharing is caring, I take time off to share with you the products here. Busy parenting didn't stop me from caring my loved ones, who has joint pain and dry skin. With the humid weather, there's almost everyday raining the humid weather almost makes my skin very irritated. 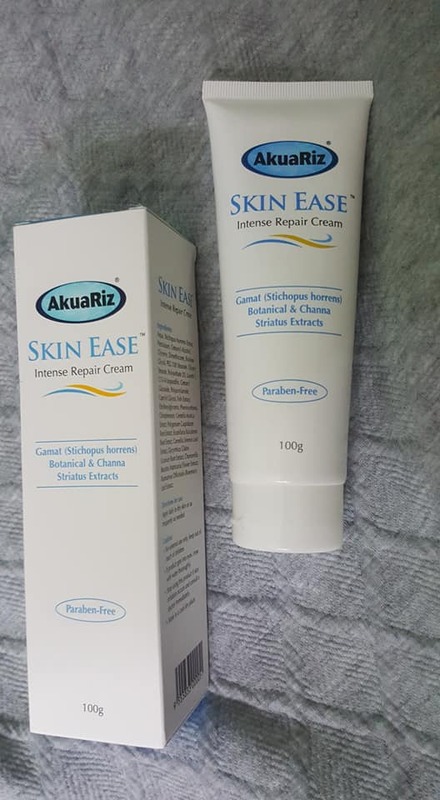 I would feel dried skin and uneasy at night, I am glad to have find this AkuaRiz Skin Ease Intense Repair Cream. My skin's condition has improve and I didn't feel so irritated anymore. 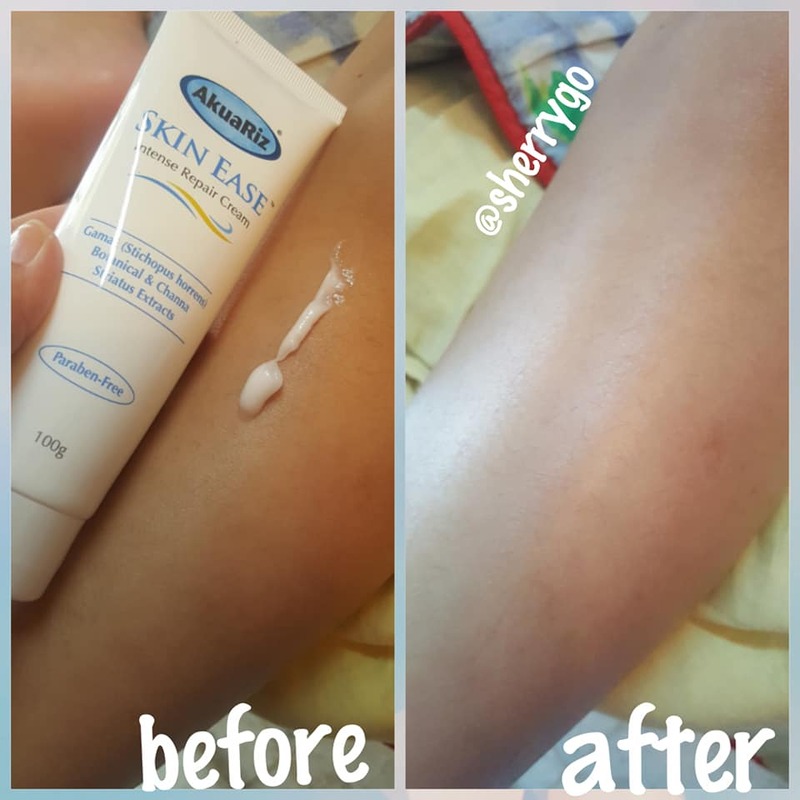 A nourishing, moisture boosting, non-steroidal cream that effectively helps to relieve dry and itchy skin commonly associated with sensitive and dry skin. The core ingredients - Sticohopus horrens and Channa striatus in combination with a proprietary blend of botanical extracts to repair, soothe and calm skin. applying on my son's let and I can see and feel the difference before and after. I am using this cream too as it is easily absorbed, deep penetrating cream also locks skin moisture from trans-epidermal water loss (TEWL) resulting in a protective skin barrier which helps in soothing sensitive skin and minimising further skin irritation due to dryness. 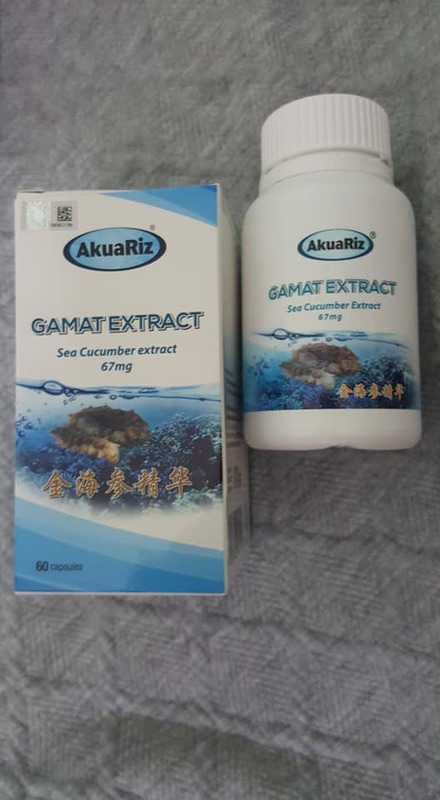 AkuaRiz GAMAT EXTRACT Sea cucumber extract 67mg .This is 60 vegetables capsules per bottle. 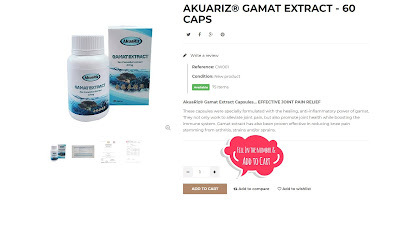 Each 465 capsule contains 67mg of Stichopus horrens extract. My family members has got joint pain and glad to share this with her. This not only works to alleviate to joint pain, but also promote joint health while booting the immune system. Gamat extract has also proven effectively in reducing knee pain. Just consume two to three capsules after meal a day. 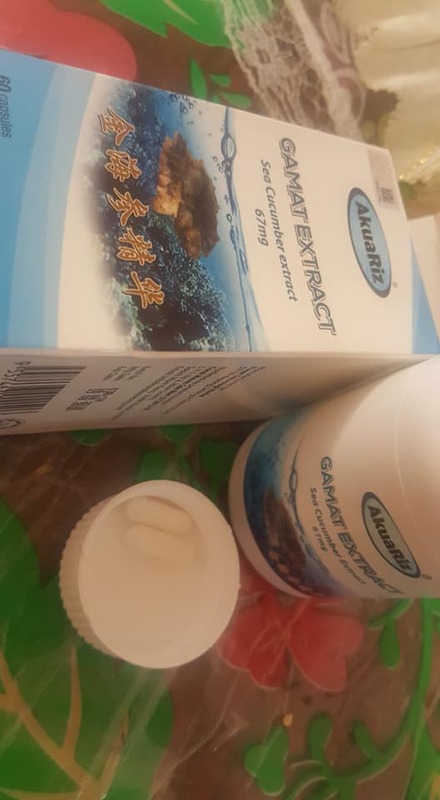 This is a traditional medicine, please consult your doctor/pharmacist before taking this product. With Internet access we can do research and online shopping from home and office. 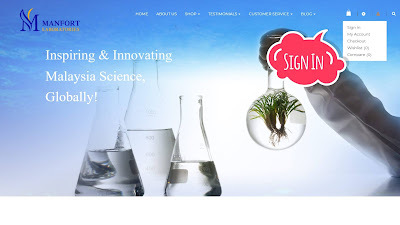 Sharing is caring, this website is user friendly and you can browse many products there. 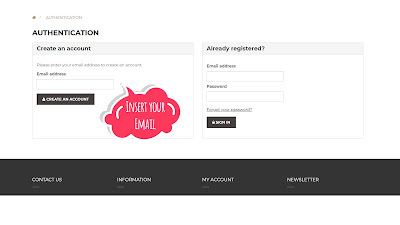 To get start you can create an account and sign up using your email address. It's free to sign up there's no charges on this. Step 5 is Continue Shopping or Proceed To Checkout.